Cake texture is incorrect for some states (when partially-eaten). When eat 1 part of cake TEXTURE look normaly (when eaten). But when eat 2 part of them texture look the same like before eaten any parts. 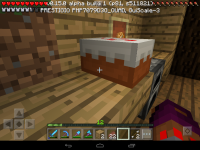 MCPE-8996 Cake shows black and orange particles when broken.